Friday Follies: Who Let the Dog Out?! The dog appears to be in no hurry whatsoever, a real cool customer just out for a stroll. It’s worth a minute to click on this and zoom in for a good look. As someone pointed out in the comments yesterday, there’s a ruckus of some kind on the sideline. Look closely at the Rice band guys–only a couple of them have noticed the dog and a few more have turned around to see what’s going on behind them. 7 Responses to Friday Follies: Who Let the Dog Out?! Very amusing. That dog is pre-Reveille. The first one was a small, black mutt whose career started in 1931. I guess dogs were a big part of Aggie Land from way back. I thought I spotted the Aggie Band in the first photo. I saw what looks like a tuba and some Sousaphones. The CTs seem to be streaming along the side line. I wonder if they are going to make a corridor for the Aggie team as they return from their locker room for the second half. 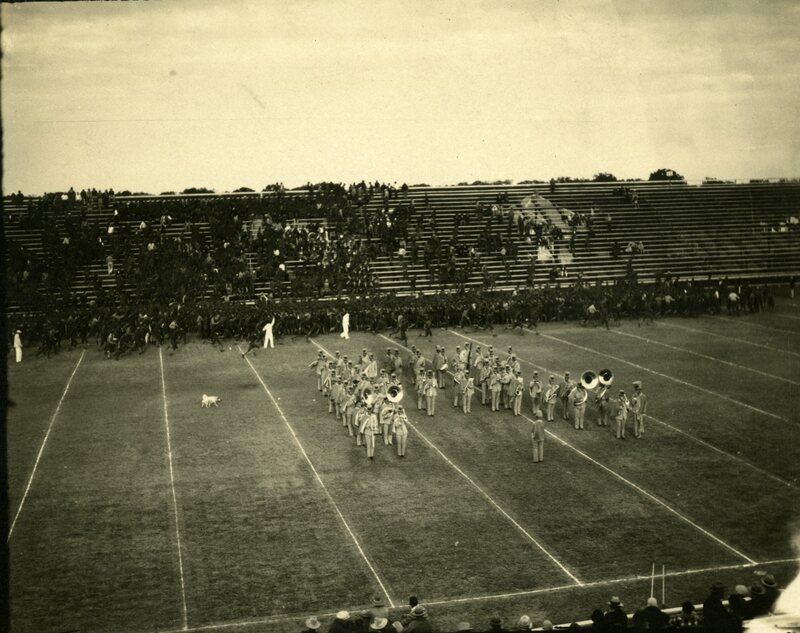 Is the “ruckus” perhaps the Aggie Corps Band, which has long had a habit of lining up along the side of the field before playing at halftime? The person at the 40 appears to be absolutely sprinting. The Farmers always entered from the north end, not the sideline. I checked all of the even-year next-week Threshers from the ’20s to 1930, and find no reference to anything outside of the games. C Kelly provided the clue to figure out the moving mass of CTs on the sideline, in the first photo comment to the previous RHC post, “Jumble”. The members of the corps are positioning to form “that famous Aggie “T” formation”, as it appears to always be named. Rather than just the members of the band, this formation includes all of the ambulatory members of the Corps – a fairly large number of bodies to assemble in a short period of time – in whatever is left of halftime, after the opposing band finishes their show. As we can see in this installment, respect for the “space” of the opposing band is a somewhat loose concept. Perhaps this explains the mass of Aggies that formed on the field post-game, in 1973, after the game that included The MOB’s infamous Aggie “T” at halftime. The Aggies may have been trying to form a “T” like this at Rice Stadium – and the various peace-officers who were trying to prevent a riot herded them into a box, rather than a “T”. I’ve wondered what they were trying to accomplish, since that day. Does anyone else from the ’60’s remember Sobie?